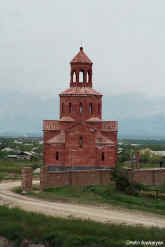 Continuing straight from Verin Artashat one reachs the village of Dvin (till 1950 Dyugun Hay). and richest city of Armenia. At its peak, Dvin's population may have surpassed 100,000, with Armenians, Jews, Arabs, Kurds, and others living together in reasonable harmony under a Muslim governor appointed by the Caliph in Baghdad. The Arab geographers reported that Dvin (called Dabil in Arabic) exported a wide range of wool and silk textiles, "Armenian wares" of a quality famous throughout the Muslim world, some elaborately figured and dyed with cochineal. Excavations at Dvin from the 1940s through 1970s revealed metal-working, glass-blowing, other luxury goods, and gorgeous glazed pottery, as well as coins from a mint that functioned at least until AD 930. The city was walled, with multiple gates labeled for the roads they served: to Ani, Tbilisi, Nakhichevan and beyond. Turning R on a paved road before the modern village of Dvin, pass S through the village, and enter the site on the left through the gate in a metal fence. First monument is the massive foundation of a major 5th c. basilica, dedicated to S. Gregory the Illuminator, with a smaller, centrally planned church built inside it when the basilica collapsed in one of Dvin's many earthquakes. Beyond are remains of the small S. Sargis church and a palace (excellent column capitals), presumably the remains of the palace of the Katholikos. From the testimony of the 10th c. Arab geographer Ibn Hawqal, this palace became the cathedral mosque of the city. Following a path right, one crosses a small green gully with cows to reach the old excavation quarters, now the storage area for worked stone blocks and the site of a small museum with excellent Persian-style glazed ceramic bowls from Dvin’s medieval period. Left above the museum, a path leads up to the citadel. One km S of the citadel the archaeologists found remains of a large 5th c. market building.